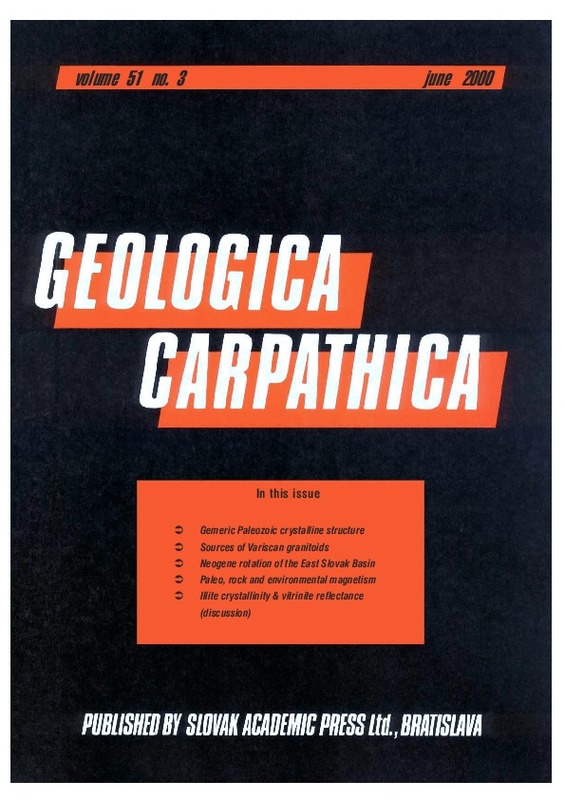 Abstract: Paleozoic highly metamorphosed rocks were sampled in 4 localities situated along the Kosice-Margecany shearing zone (East-Carpathian dextral system), on two sites situated close to the Dobsina shearing zone (West-Carpathian sinistral system), and on one site situated within the Gemeric Superunit. The West-Carpathian and East-Carpathian shearing systems resulted in the division of Gemeric Superunit into a mosaic of small tectonic blocks. Each site sampled for this study represents one such block. Our paleomagnetic study revealed that the rocks became remagnetized in the Middle Miocene after a regional CCW rotation, probably during the period between anomaly 6 (20 Ma) and anomaly 5 (10 Ma). After the remagnetization epizodes the blocks underwent rotations (around their vertical axes) associated with activity of respective dextral or sinistral shearing zones. The results of the AMS study suggest a correlation between the magnetic fabric and the Alpine tectonic deformation episodes. Abstract: Detailed reviewing of several existing Rb/Sr datings from the West-Carpathian granitic massifs shows that the Rb/Sr dates older than U/Pb zircon data are possibly caused by inclusion of high Rb/Sr samples in the sample collections. Such samples, usually occurring as leucocratic veins in metamorphic complexes, usually have higher initial 87Sr/86Sr ratios which results in generating pseudo-isochrons. Therefore, there is no need for an initial mixing line as suggested earlier. Some samples outlying both above and below isochrons may be interpreted in terms of system opening at a time different from the initial closure. Depending on reconstructed Rb/Sr ratios late Variscan to Early Alpine ages are obtained for the opening. In contrast to Rb/Sr, previously published Sm/Nd data show that the initial 143Nd/144Nd ratios were not homogenized making it possible to suggest end-members responsible for the observed variation. Such end-members are sought in (1) the peraluminous (leuco) granites that originated through dehydration melting of gneisses with fairly high ISr and (2) gabbro/dioritic rocks occurring within granite massifs or as mafic enclaves. Assimilation of supracrustal rocks by the mafic magma could have produced either sub- to metaluminous I-type granitoids or peraluminous S-type granites depending on proportions of the end-members. The varying proportions may also have been responsible for the mineralogical and petrological differences observed between the two groups. Seven different sources are suggested for all the Variscan granitoids in the Western Carpathians. Abstract: Paleomagnetic investigation of sedimentary and volcanic rocks of the East Slovak Basin gave information about the counterclockwise (CCW) rotation of the Neogene units of Eggenburgian to Middle Sarmatian age. The Eggenburgian sediments (1 loc. 20 spec.) show about 80° CCW rotation, the zeolitized rhyolite tuffs of Lower Badenian age (2 loc. 19 spec.) show a 40°–60° CCW rotation, the rhyolithes (1 loc. 3 spec.) of Upper Badenian age about 50° CCW rotation, the sediments of Lower-Middle Sarmatian age (1 loc. 6 spec.) gave CCW rotation of about 20° and the youngest post-Sarmatian rhyolite (1 loc. 9 spec.) did not yield any rotation. The rotation was preceded by left lateral penetration of the Tissia units into the West- and East-Carpathian boundary zone.